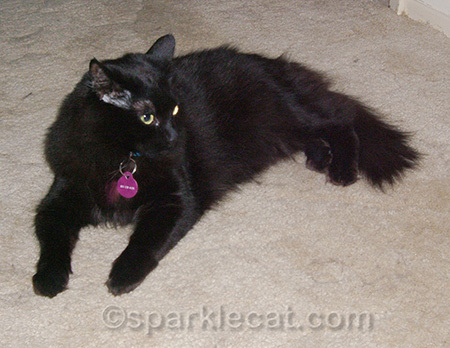 Smokey is a beautiful longhaired black kitty who belonged to my human’s father. She is probably about 11 years old, but still playful. And she’s very lonely and scared right now because my human’s father died yesterday. My human loves Smokey a lot (although I will say I hear the feeling’s not completely mutual), so she immediately went over to the assisted living facility where her father was living and fetched Smokey, the cat tree she bought her, and her leftover food (except for the dry stuff — “You’re only getting wet food from now on,” she said), and brought her home. Right now, Smokey is in a part of the house that can be shut off from the rest of us kitties, and she’s hiding under a bed. My human checked on her, and she did eat some of her dinner. She will calm down in time, I’m sure, but this is the third time in less than three years that her life has been disrupted. First when my human’s father moved back to Los Angeles from the Central Coast, and again a year later, when he moved into assisted living. Now, Smokey has lost her human altogether. Like I said, my human loves Smokey and wishes she would be happy here… but she has to be honest and admit that this isn’t the ideal living situation for her. Smokey really needs her own human and she won’t have that here. 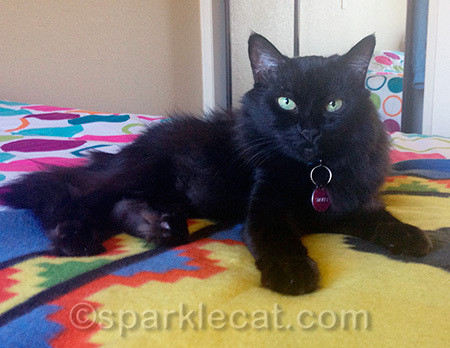 Binga and I own the humans here, and Boodie does not mind being the extra cat. My human feels bad that Smokey would just be another cat in the crowd, since she thrives on human attention. She’s not a mean cat — she is really quite sweet — but she is not all that fond of other cats. Smokey was originally adopted with another cat, and they just sort of tolerated each other. The other cat got cancer died a couple of years ago. So as you can see, while Smokey will always be welcome in our house, ideally my human would like to see her in a home where she has her own human and lives with just one other cat at the most. She would be perfect for an older, stable human, maybe retired or maybe not. Smokey just wants a human to call her own, pure and simple. She’s healthy and active and has many more years to spend with someone. Plus she’s beautiful. If you know anyone in southern to central California who might be suitable for Smokey, please let us know! Although I will warn you — my human will be very careful about whoever Smokey goes home to, and will probably want to visit your home and stuff. Maybe she will bring me along when she does that, so it’s not such a bad thing after all! By the way, my human was trying to figure out Smokey’s age, when she came across this photo of her from 2005, when she was a young adult kitty at my human’s parents’ old house in Los Osos. 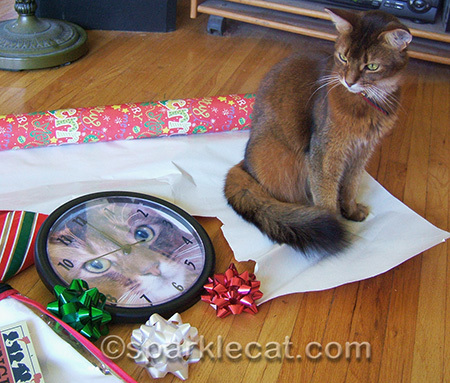 That was from Christmas, and it was the same year my human gave my parents a clock with Sparkle’s face on it. She has the clock now. Dear Janiss..Baby Tali and I are so sad at finding out about the loss of your Dad..I understand how hard it is when this time in life comes to you..My Dad died when I was only 10 years old and I still miss him so much..I know that Smokey is in your loving hands and you will do the best possible thing for her..Three moves in three years is a lot of change for a kitty to go through..Hugs..
Oh NO! I’m so very, very sorry about your loss. The three send many comforting purrs – thinking of you. 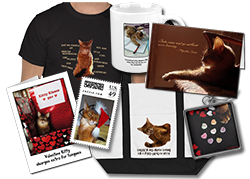 And thinking of Smokey, too…. When I send condolences I had no idea you took Smokey. So much change. Thank goodness you did this or he would have ended in shelter. Please take good care not to work too hard and get Feliway for poor Smokey. Hugs and mega purrs for all. Oh gosh, we are so late in reading this, thank goodness for the Caturday Report. We would like to say how sorry we are for you Human’s loss of her Dad–we are sending purrs and e-hugs westward. We’re only seeing this now, we’re so sorry your human’s father passed, please accept our (belated) condolences. We’re sending purrs that Smokey finds the right forever home. Surely the blogosphere and social media can make this happen! Paws crossed for her and hugs to your human. We are very sorry for the loss of your human’s father. She is very sweet to care so much about Smokey getting a really good home! We hope she finds the perfect home and Smokey won’t have to make any more changes after that. A warm hug for your human, Summer. So sorry for you loss. Keeping our paws crossed for Smokey! Hi there. 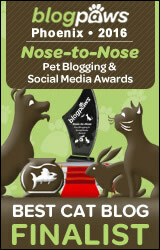 We found you through the Pet Parade Blog Hop! Smokey is gorgeous. But sorry to hear the sad news about your human’s father. Janiss, we are just now coming around to visit and are very saddened to hear of your father’s passing. We are sending you our love and gentle thoughts in your time of grieving. May he rest in peace and may you find peace in his absence. We hope Smokey finds the best possible home and that she will once again be the cherished Queen of someone’s Heart. Please accept our condolences on the loss of your human’s father. Purring and praying that Smokey finds the right home for her. She is such a beautiful girl. I’m sorry to hear that your human’s dad passed away. That’s never an easy thing to go through. I’m sure you will be able to find Smokey the perfect new home. She’s lucky to have all of you looking out for her and comforting her during this stressful time. She is a beautiful girl. We are so sorry to hear of the passing of your Human’s father, sending love and many purrs to your Human. We also send purrs to Smokey as she grieves her loss and we will purr for the right and perfect forever home to come forward where she will be cherished. Summer and family, our condolences, and to Smokey special hugs and love. If we can help in any way to circulate appeals let us know OK, Summer? We will do our best of our best to help. I know Smokey will be upset but I guess a good thing is she is not abandoned and unloved. Marjorie, Silver, Miranda and Harvey. You have our condolences for your human on the loss of her father. It is always so hard to have a parent leave. Prayers for her. Smokey is beautiful and I am sure she will have a wonderful person come forward to love her back to a happy life. I hope it all comes together quickly for her and for your human, too. Holding them both close. Love and hugs to your human and to Smokey. I will hold good thoughts for both of them. We are so very sorry about your humans father. Sending mega purrs to all of you. We will purr for Smokey. As you know my mom has a soft spot in heart for kitties who look a bit like me. So sorry to hear about your human’s father’s passing – please pass along our thoughts and condolences to her. And we surely hope that Smokey finds the purrfect home where she will truly thrive. We are happy to know that she has a wonderful home with you in the interim. We will share your post. We are so sorry for the loss of your humans Father. I’m sure Smokey will have a loving home of her own in no time. We sending purrs and prayers ti you all.